Your snow is simply breathtaking. I'm sighing for snow here... we just got a glaze, and you got a thick layer of frosting! Very jealous. I love you, Dottie Angel! Haha. Always love your inspiring posts, and nothing like a row of bobbles to make you smile! The pictures at the top of your post are awesome. I love the look of snow but think we have seen enough this year. Perfect excuse though for giving into our passions though. The bobbly crochet looks great. Hope to see it on a project soon. i love your day! bobbles are beautiful- almost snow like. enjoy the comfort! it is sunny, but chilly here. i feel guilty hanging out inside, but uncomfortable when hanging out outside. what's a girl to do? your list of 'things to like' today. Good to just find things to like even if there are things to drive us crazy! Today it is snowing and Winter has decended down hard all around us once again on the Nebraska prairie. A bit hard to swallow after our 70+ a bit ago. But....amoung other things, I 'like' the Canada Snow Geese roosting and feeding in the field to the west of me, on their way North I suppose. That is a sign of hope...and the calender day says it is one day closer to Spring anyway. love the bobbles...not the snow (although your photos are wonderful)....our long, for the uk, shift of snow at Christmas has cured me of that yearning for this winter. 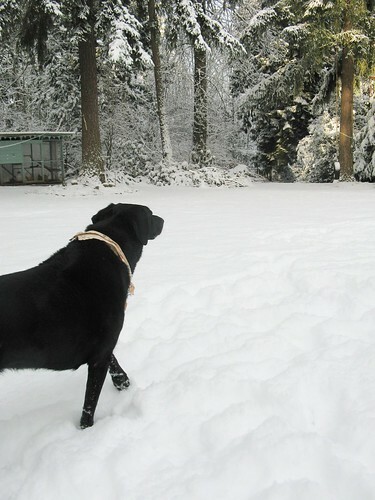 Dear Tif, we're having the same snow day down here in the Columbia gorge in Corbett. I was supposed to volunteer at Multnomah Falls, but they closed it for the day.. so now I get to crochet the border around my rainbow granny stripe blanket! I've got similar photos on my blog, hope you pop over and look. Lovely to see all the things you are enjoying in the last few posts. I'm so glad the snow seems to be gone from our parts! Love the Bobbles! 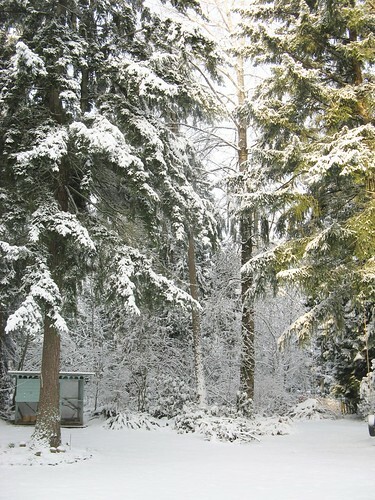 Wishing for spring here - we have had record breaking snow and snow days. thinking of you from southern UK where it was 14 degree c and sunny today. Not that I am bragging or anything....! bobbles are my very favourite things....I love to make bobbles...the more bobbles, I say, the better!! Enjoy your Mr Hook time! I got a bobble crochet knee-length sweater (am in *love*) today at the favorite Thrift! I had no idea that was what it is called, and here you are writing about it - must be my double-lucky day. I do like the bobbles..would love to know how to do that! Oh how I love the colour of the clogs and the flowers ... just right for a snowy day! I love little Olive with the scarf, so cute. The atmosphere at mossy shed looks so different when there is no snow. Take care your health well. 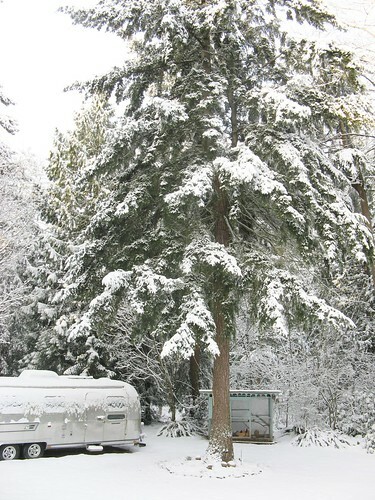 Lovin' the snowy pics, that tree in the first pic makes the airstream look tiny, must be one huge mama of a tree. Looks like someone got out there with a snow gun and went crazy, shooting snow all over the place. Oh so lovely snow!!! 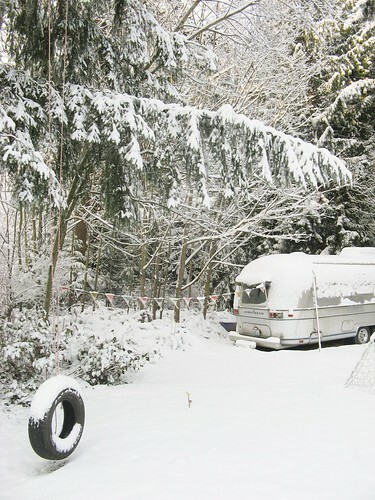 I dreamt there was snow in sunny ole' Bournemouth last night (bizarrely as it was positively spring like yesterday!) Was almost disappointed when i woke up! 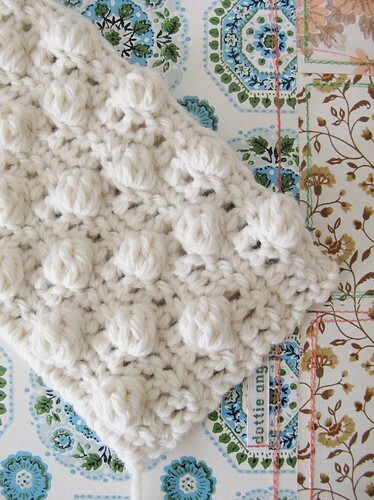 awh bobbly crochet, i need to learn how to do that. looks amazers! oooh I do love bobbly crochet! I like this post. new at crocheting, your bobbles are motivating. Love the white crochet bobbles - do you think you were influenced by the snow??!!! Those beautiful orange flowers (Chrysanths? 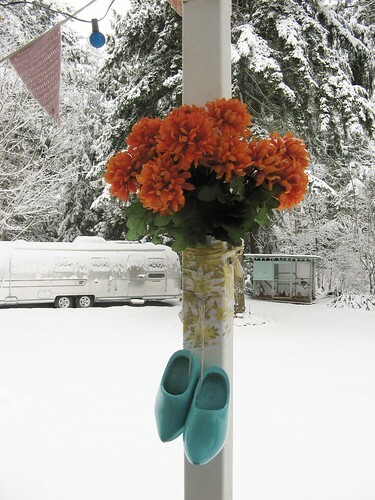 )look fantastic against the snowy backdrop and the cute blue clogs - so cheery! Have a great snow day - has actually been springlike here in the UK today. 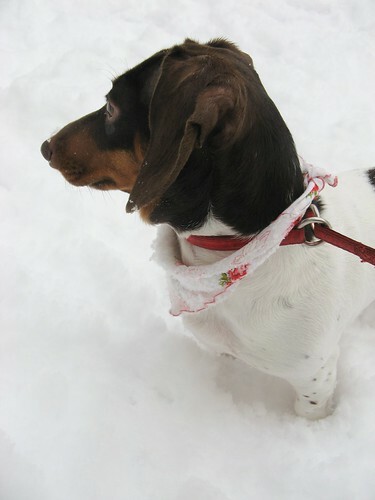 Of course your dear doggies wear hankies for bandanas -- why am I so delightfully surprised?! 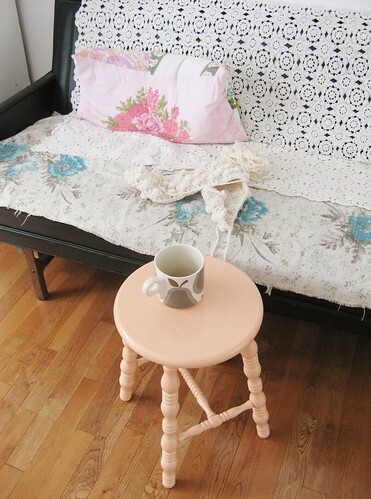 Enjoy the snowy-stay-at-home-being-creative day. I like to make big pots of soup on days like that, and am eating orange soup today. Orange food actually can be really, really delicious -- mine is carrot soup with potato, tomatoes, onion, basil, and veggie broth, all simmered together and then pureed with a hand-held blender right in the big soup pot. Very satisfying and rib-sticking! indeed we have extremely tall trees in our back yard, actually everywhere! I love your blog and all your creations. Hoping u could share the instructions on how to make the bobbles? They are so cute:)Ty. omg love that peach color!! !